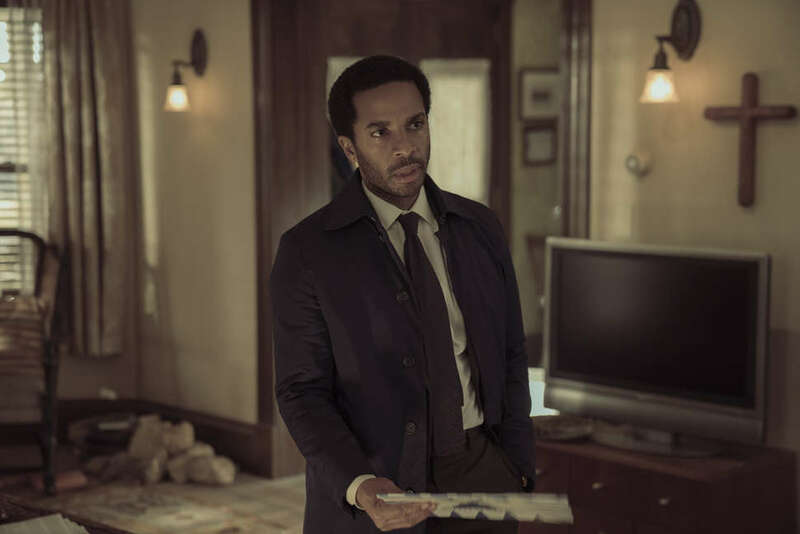 This article contains major spoilers from the first season of Hulu's Stephen King-inspired drama Castle Rock. Please tread lightly. If you've been paying close attention to Castle Rock, you've noticed a whole slew of Stephen King Easter eggs connecting this anthology series to a multitude of fan-favorite stories, novels, and movies alike. 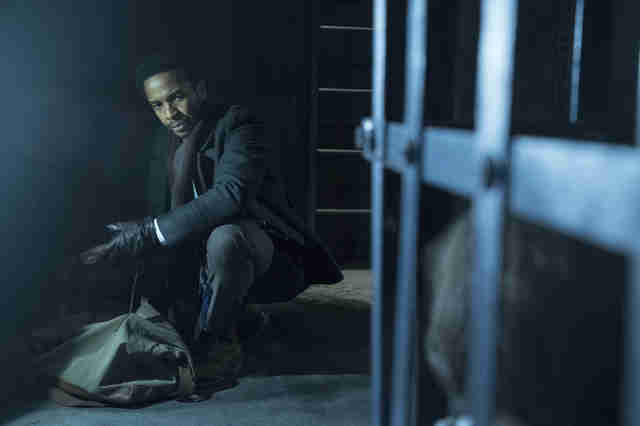 Over the course of 10 episodes, the show's slow burn made the tale of Henry Deaver's (Andre Holland) disappearance, his triumphant return, and subsequent mission to find redemption for himself and the mysterious Kid's (Bill Skarsgard) that much more dramatic. As Wednesday's finale, "Romans," hit its climactic peak, the story took an unexpected turn. Instead of helping the Kid get back to his reality, a curveball was thrown our way, possibly showing the young man's true identity, provoking Henry to throw him back into that underground cage he was originally found in back in Episode 1. As satisfying as it's been to tie Castle Rock to Stephen King tales like The Dark Half, Needful Things, and The Dead Zone, to name a few, the way in which the events played out has left us scratching our heads. Has co-creators Sam Shaw (Manhattan) and Dustin Thomason (Lie to Me) played Devil's advocate, showing us what they want us to see while the real truth lurks right under the surface? Whatever the case, here are four plot details we probably won't stop thinking about until Castle Rock returns for Season 2. Do vampires exist in Castle Rock? 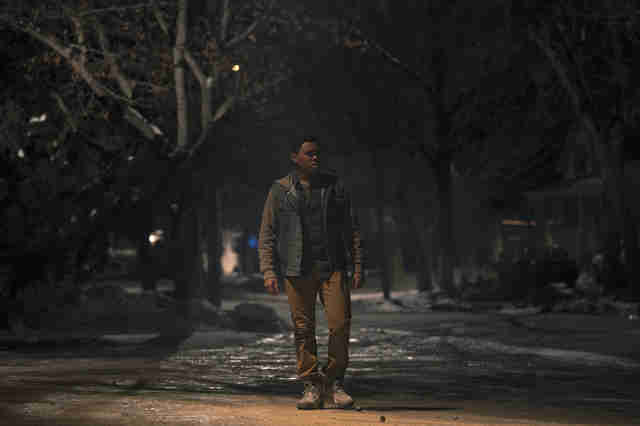 As we saw in Episode 8, "Past Perfect," Henry's son Wendell (Chosen Jacobs) goes against his father's wishes and exits the bus before it can take him home. It's brief, but as we see Wendell exit, a sign for Jerusalem's Lot can be seen on the side of the road. A short story of the same name was first published in Stephen King's horror anthology, The Night Shift, in 1979. For those unfamiliar with the supernatural tale, the story takes place in the city of Jerusalem's Lot in 1850 -- and acts as the prequel to Salem's Lot, King's take on the vampire genre. If you really dig deep into the Stephen King secondary universe, you'll find that a map exists of ancillary cities just a stone's throw from Castle Rock. There's Derry, Maine, where many of King's stories take place. But that's just the tip of the iceberg. And, much like in his literary works, characters from one book end up showing up, even if just in passing, in a multitude of others. Jake Epping in 11/22/63 -- played by James Franco in the Hulu original series -- ends up mentioning Pennywise and the Losers Club in passing in the novel. Randall Flagg may be the dastardly villain in King's epic The Stand, but he also shows up in The Dark Tower series, as well. This connectivity opens up so many possibilities for Season 2 of Castle Rock. It's been shown that time and space may merely be a construct in this reality, alluding to the existence of supernatural, otherworldly anomalies like thinnies and subaudibles -- which are directly connected to the todash space, the nothingness that exists in between the fabric of the multiverse. And if the show's going to get that bonkers with its story, one has to believe we'll be seeing vampires at some point. Will we get more of Stephen King's Multiverse? It's one thing to discuss the Master of Horror's fictional (cinematic) universe, and another to really delve into the concept of the multiverse that exists within this secondary universe and unpack how this complicated idea has not only taken shape in his work over the past four decades, but how it will present itself in Castle Rock moving forward. In Season 1, Henry Deaver begins to hear a ringing in his ears. His reverend father believed the noise to actually be the Voice of God. Through his investigation, though, Henry comes across a duo living in the woods -- a deaf scientist by the name of Odin Branch (Charles Jones), and his sidekick Willie (Rory Culkin) -- who explain to him that the sound he is hearing is actually a symptom of a more chaotic issue: The universe, through the imbalance it's experiencing with the Kid's release from prison, is attempting to correct itself. Of course, Henry's the one hearing the high-pitched noise because, as the story goes, he fell through the veil separating our reality from an alternate timeline. The show asserts that Henry, and those who have come in contact with the other side, will have a ringing in the ears. Or as Odin calls it, "a schizma." This idea is similar to the "subaudible" in The Dark Tower series, which is tied directly to the appearance of "thinnies," which are rips in the veil that allow access to other realities. Welcome to the Multiverse. These concepts are nothing new to Stephen King fans. One could speculate that the time travel portal Jake Epping stepped through in 11/22/63 was a thinny. And, of course, the Arrowhead Project -- the MKUltra-style organization, which was also linked to the events in Firestarter and The Tommyknockers -- conducted experiments that opened up a thinny in King's tale, The Mist, giving all sorts of unspeakable monsters from another realm access to our world. In 11/22/63, Jake Epping's presence in the past, as well as the future, acted as a catalyst to a bunch of violent ends. This butterfly effect caused the appearance of a quirky character known as The Yellow Card Man, who acted as an unspoken guard, attempting to maintain the sanctity of the universe. In doing so, every time he'd see Jake, he'd scream that he didn't belong there. It's a similar sentiment made clear when the Kid (aka Henry #2) yelled, "I'm not supposed to be here!" throughout the Season 1 finale. In the end, Henry Deaver never ended up helping the Kid back to his world. Leaving things unresolved, one has to assume that the universe has not righted itself. And with the existence of the schizma, ringing in both Henry and Wendel's ears, it's only logical that this is just the tip of the iceberg. Just how far down this kooky rabbit hole will Castle Rock go? Is the Kid actually the Devil? Okay look, we get how upsetting it would be if the Kid, aka Henry #2, wasn't actually Henry from another reality… or even human. It would make Episode 9, "Henry Deaver," feel like a complete waste of time. After all, for nearly an hour, the audience was given the heartfelt backstory of the Kid's life across the veil. This other timeline acknowledged him by name: Henry Deaver. Sure that was a mind-blowing plotpoint, showing us that Henry here had gotten lost in our world after the other Henry disappeared when he was just a boy. But what if that was all a ruse? From the very beginning, Warden Lacey (Terry O'Quinn) was convinced the Kid was the embodiment of the Devil and kept him locked in a cage underground for 27 years. And even after Lacey took his own life, his replacement, Warden Porter (Ann Cusack), ended up coming to the same conclusion before stepping into the street where a bus full of prisoners mowed her down. What if the Kid is actually the Devil? If you look at the clues the show has left along the way, and the rules that exist in this world, it starts becoming a very real possibility. Clue #1: Like Ruth (Sissy Spacek) with her chess pieces, the Kid places mini-figurines throughout the world as he goes. But while Ruth uses her chess pieces as anchors to help her battle her Alzheimer's disease and stay in the present, the Kid's figurines almost feel as if they're meant as the opposite: human-shaped pieces, manipulating each and every character he comes in contact with, as if he's the player and they're the pawns. Clue #2: When the Kid destroyed Juniper Hill and returned to the Deaver household, he shared a very odd interaction with Ruth. Of course, the series wants us to believe that Ruth's dwindling grasp on reality is to blame for the way this confrontation went down. But, if this really was Henry from a different timeline, why was he being so unbelievably creepy with his mother? Unless Ruth really isn't his mother. You know, it sure would be something if the Kid's end-goal was to isolate Ruth, ultimately pushing her to the brink while putting an end to Alan Pangborn (Scott Glenn) in the process. Clue #3: This leads us to the constant reminders that the Kid had first appeared in Castle Rock 27 years ago. It's the same time-span between Pennywise's visits to Derry. And in 1991, Alan Pangborn originally did battle with the Devil when he wreaked havoc on Castle Rock as Leland Gaunt, the owner of the oddities store known as Needful Things. Is it possible that, even though Leland Gaunt was defeated by Pangborn, using a sleight-of-hand magic trick, the Devil could've lived on in another man's body? More specifically: the Kid's body? If so, that would be one magic middle finger to Castle Rock's former sheriff. Needless to say, things just got way more complicated in Castle Rock. Will Season 2 go to The Overlook Hotel? While King's original story about a father who goes mad in a snowed-in hotel doesn't make mention of the city of Castle Rock, "Doctor Sleep," the story's literary sequel, does. And after multiple ancillary style references to The Shining, it seems that Castle Rock may be taking a trip out west once the show returns. 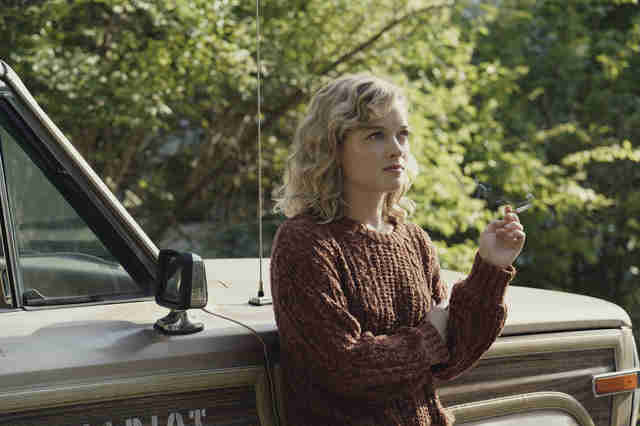 During a mid-credits scene that appeared in the finale, Jackie Torrance (Jane Levy) is shown working on her memoir, aptly titled "Overlooked." After she's asked what it means, Jackie replies, "Backstory. You know, ancient history. It's family history. I'm actually headed out west on a research trip next month. The best place to finish a book is where it started." Does this mean Season 2 of Castle Rock will venture outside of the city and head to the iconic hotel? It would definitely be an intriguing choice. Not only is Jackie apparently Jack Torrance's niece, but in Stephen King's 1977 novel, as well as Stanley Kubrick's 1980 film adaptation, Jack used the family trip to The Overlook at the perfect occasion to finish working on his own novel. The story synchronicity wouldn't stop there, either. In "Doctor Sleep," Danny Torrance ends up making his way back to the Colorado hotel in the book's action-packed climax. Ewan McGregor has been tapped to play Jack Torrance's tortured psychic son in the movie, which is set to hit theaters in January of 2020. This all leads us to wonder: Could Jackie and Danny actually meet? Of course that'd mean the Hulu's series and the Mike Flanagan (Oculus, Gerald's Game) directed film would have to proverbially cross the streams. There would be a bunch of moving pieces involved in making that work. But as Stephen King's cinematic universe continues to expand, we'd like to think this family reunion is not out of the realm of possibility.